Players like Ronaldo, Messi and the legendary Pele weren’t born superstars. They were developed into them through endless hours playing futsal. It was on small, densely packed pitches that these players learned how to dribble as though the ball was glued to their feet, to develop rapid decision making and to shoot with laser pointed accuracy. All of these players attribute their success to the tight skills they developed playing futsal from a young age. Now you can harness the benefits of this fast paced game for your own team. 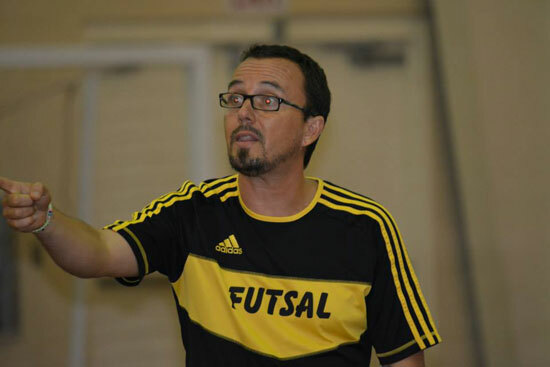 From Futsal to Soccer, Everything you wanted to know about coaching Futsal…and how you can use it to develop better soccer players, provides a complete guide to using futsal in training. 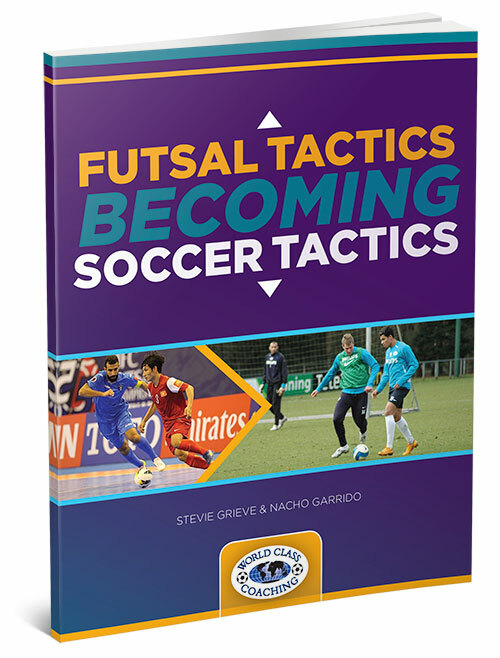 This two part book provides a comprehensive look at how the principles, tactics and techniques of futsal can be harnessed to make training more fun, motivating and effective, and enable you to create players with silky skills and the soccer brain to match. If your players are bored of running around cones, From Futsal to Soccer could be exactly the guide you’ve been looking for. With the pace of the modern game rising all the time, developing players with the technical skills and reactions of futsal players will also give your team the boost it needs to dominate games and make the opposition look as though they’re standing still. Rather than standing in lines and running around cones, it’s through playing futsal that many elite level players, particularly in Brazil and Spain, developed their silky ball skills, smooth passing and lightning quick decision making. Players love small sided games, and the benefits are obvious. Players get more time on the ball, more touches and the intense nature of futsal puts them under more pressure to be perform. It’s a wonder it’s taken so long for coaches to realize the benefits of harnessing futsal in their training programs. From Futsal to Soccer explains everything you need to know on how to use futsal as a development tool. This includes a guide on the skills and principles relevant to 11v11 games, how elite level teams demonstrate the spirit of futsal in how they play and training drills for creating development focused futsal practice sessions. 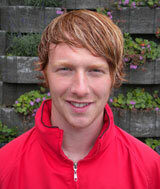 Stevie Grieve has been coaching since 2003 when he started at the age of 16. Stevie started out developing technical footballers – which is always his primary focus – but as he has grown as a coach, he has taken more of an interest in tactical development and future evolution of football, analysing various teams and looking to find unique parts of their play and expose it to the footballing community. Since 2003, he has coached a number of clubs, both grassroots and professional, with players of all ages and abilities, including Dundee FC, East Fife FC, Raith Rovers FC, FC Gland, United Soccer Academy and Head of Youth Development and 1st team Head Coach for Garhwal FC. He likes to push himself to the next level and has considerable experience in working in different environments; Stevie has worked full time in 4 countries on 3 continents; Scotland, Switzerland, USA and now currently, India, where he works at the Head of Youth Development for Garhwal Heroes FC, and as Head of Coach Education for Bhaichung Bhutia Football Schools, where he leads a team of over 80 coaches and over 1,200 players. Nacho Garrido started playing Futsal at the age of five, and continued all the way through his teenage years before turning pro at 17. He then continued to play futsal professionally for 18 years until the age of 35. Prior to his retirement, Garrido also coached many different teams and levels, including university teams and both male and female players. After becoming a professional coach in 2008, Garrido even managed to first division sides in Spain and France. Wherever he coaches, at the core of Garrido’s philosophy is training teams to have a disciplined formation. This has even led to him speaking at seminars around Spain (Murcia, Logroño, Córdoba and Ferrol) and around the world (Croatia, France, Italy, Bermuda and the USA). 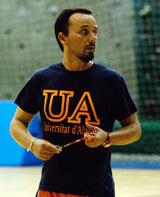 This season Garrido will be coaching Universidad de Alicante – UA, a Spanish first division women’s side. He will as be continuing to present his Project F5F11, which reinforces the improvements coaches can gain from training with futsal. Grieve outlines the benefits for players and provides real life examples and screenshots of how these are harnessed by players at an elite level. This includes moving the ball quickly, exploiting space, passing accuracy and much more. He then explains why futsal is such a valuable development tool, the traits of futsal players and how the principles of futsal are relevant to 11v11 games. Grieve then looks at valuable futsal techniques, including the toe poke, protecting the ball with the sole and using the sole to open up space. This is backed up with examples of how Ronaldinho, Ronaldo and Neymar use these skills to devastating effect in real games. In the third part, Grieve assesses how Manchester City, Barcelona, Brazil and Ajax all demonstrate the benefits of futsal and how it could have influenced aspects of their play. 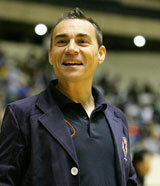 Garrido provides his own insights on how futsal can improve team performance. This includes improved player reaction times, decision making, patience and playing with speed. It’s no coincidence that these are qualities Spanish players have in abundance, having grown up playing futsal from a young age. Garrido then explains the differences between futsal and soccer, in defense and attack. Aspects include support, rotation, temporization, change of rhythm and diagonal counter attacking. Actual game screenshots are provided to demonstrate how the principles of futsal are applicable to elite level soccer. Garrido also analyzes how the improvements in passing, control and dribbling gained from futsal transfer into real games. After discussing the tactics and systems of futsal formations, Garrido then provides a series of training sessions for putting all of From Futsal to Soccer’s theory into practice. Today’s forward thinking coaches are abandoning drills performed in lines or running around cones. Instead, they are switching to training methods which develop players in multiple areas in every session. For this reason, futsal should be in every coach’s training repertoire. Its complex tactics, speed of play and demands on players to shoot and pass accurately mean that you can expect to gain big improvements in multiple areas quickly. However, knowing how to implement futsal as a cohesive part of training isn’t immediately obvious. This is why From Futsal to Soccer is such a valuable training resource – it explains exactly how to do it. If you’ve ever wished you could develop a team with the pace and smooth passing style of Barcelona, Spain or Brazil, From Futsal to Soccer could be the blueprint you’re looking for. It explains exactly how you can harness the rapid skills development of futsal to create a team that’s able to think on its feet, pass smoothly and attack with a high tempo. It’s no mystery where the silky skills of players like Ronaldo and Messi come from. They don’t come as a preordained gift but from hours and hours playing futsal soccer in the streets. If you want to create elite players of your own, From Futsal to Soccer is a book that can help you do it. “In today’s soccer world think fast and anticipate the intentions of the opponent is the key, given the large physical and technical-tactical level acquired. So to train and play in a small space with a methodology that promotes decision making and creativity, is vital in the golden age of motor learning (6-12 years). There are many soccer tactics and techniques that have their origin from the game of Futsal. Futsal Tactics Becoming Soccer Tactics takes a look at how tactics used by teams like Barcelona, Man City, Real Madrid and others originated from a Futsal background. But it’s not just tactics that futsal and soccer have in common. Many of the world’s top players grew up playing futsal and swear it was instrumental in their success. Lionel Messi is a good example of how futsal skills can be used in the False 9 position. So we have also included 11 futsal related drills that translate well into the game of soccer and can be used on the training field as part of your regular training sessions. And it’s free with your order of From From Futsal to Soccer. WORLD CLASS COACHING is recognized globally for the quality of its soccer coaching resources, which are used by over 40,000 soccer coaches from around the world. We wouldn’t be offering you From Futsal to Soccer unless it achieves our exceptionally high standards. 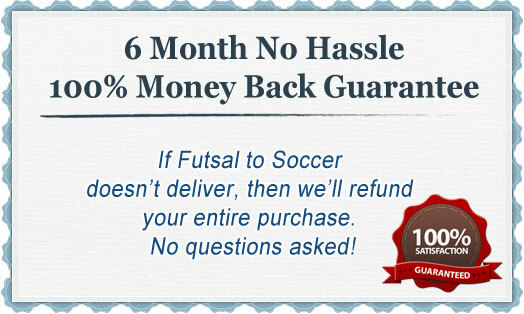 However, if you are not 100% satisfied with the quality of From Futsal to Soccer after six months then please contact us for a no quibbles refund. Making training sessions more invigorating and enjoyable for players, while technically beneficial, is a constant challenge. No player enjoys waiting in lines to perform one skill in isolation, while the benefits of this training style are now being questioned. Providing futsal style training, however, can offer a wealth of benefits – and no disadvantages. From Futsal to Soccer provides you with a complete guide on how to harness the fast pace, intensity and intelligence developed in street soccer into your training sessions. As demonstrated by elite level players like Messi, Ronaldo and Pele, futsal can be an instrumental tool in developing highly skilled, quick thinking and smooth passing players. 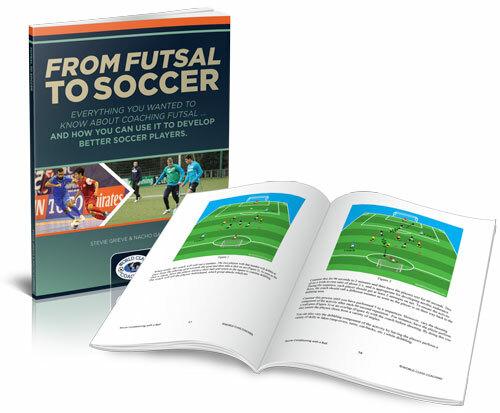 So if you’re struggling to gain improvements in training and enthusiasm levels are low, harness the power and passion of futsal in training with the comprehensive From Futsal to Soccer development guide. P.S. 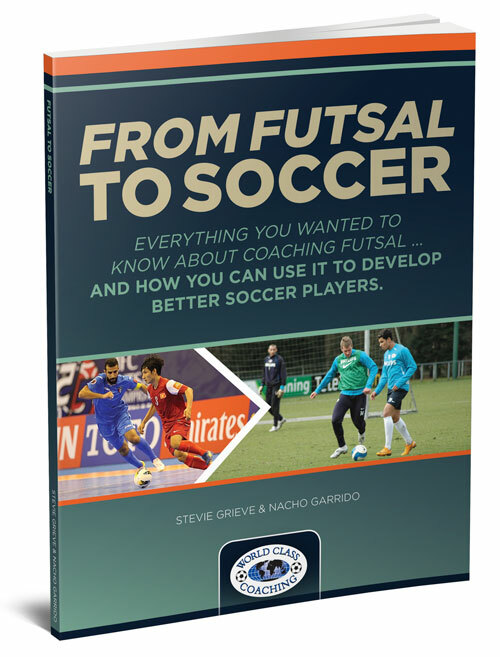 From Futsal to Soccer provides a comprehensive guide on how to harness the rapid pace, complex tactics and advanced technical skills of futsal as a player development tool. It contains a wealth of information on the principles, tactics and mindset developed playing futsal can be harnessed in 11v11 games, and how this is done successfully by many elite sides. P.P.S If you are not 100% satisfied with the quality of the soccer coaching resources in From Futsal to Soccer after six months then we will refund your purchase in full, no questions asked.